President Abraham Lincoln wasn’t the only Abraham Lincoln involved in the Civil War. The Confederates had their own Lincoln, Private Abraham B. Lincoln of Company F in the 1st Virginia Cavalry. What’s even stranger is that the two Lincolns were related. According to an article in The Pennsylvania-German magazine, both President Abraham Lincoln and Private Abraham B. Lincoln were the great-grandsons of John Lincoln of Pennsylvania, which makes them second cousins. While serving as a Congressman in 1848, the future President Abraham Lincoln learned of the possible connection to the Lincoln family in Virginia and wrote to Private Abraham B. Lincoln’s father, David Lincoln, asking about any family connection. David Lincoln was, in fact, the son of Jacob Lincoln, but Jacob had passed away in 1822. As Private Abraham B. Lincoln, who was born in 1822, was 26 years old at the time Congressman Lincoln sent the letter, it is almost certain the two Abraham Lincoln’s knew about each other, although it is not known if they ever had any contact. When the Civil War broke out in the 1860s, Private Abraham B. Lincoln found himself fighting in the Confederate army, but eventually deserted in 1864. Desertion among Confederate soldiers became common as the war raged on and food, clothing and pay for the soldiers dwindled. According to the book Desertion During the Civil War, Confederate deserters almost always returned to their communities after deserting, so it is likely that Lincoln returned to his wife and five children in Virginia. 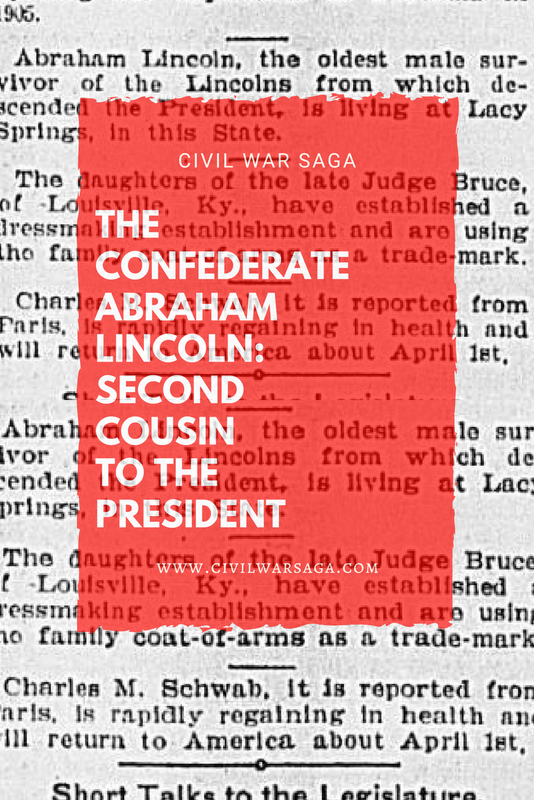 Near the end of his life, in 1903, Private Abraham B. Lincoln gave a series of interviews with local Virginia newspapers, identifying himself as the late president’s cousin. 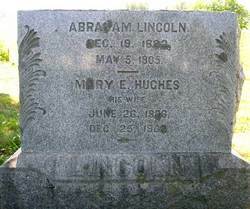 Two years later, he passed away at the age of 83, and was buried at Lacey Spring Cemetery next to his wife, Mary E. Hughes. It seems that Lincoln had many adventurous ancestors and relatives who seem determined to take their own unique path in life. This is a story I have never heard before. Stories of Mary Todd’s Confederate kin are common and it is nice to see stories like this about the president. It reminds us the war was truely brother against brother and many of us had family that fought on each side. Thanks for listing the source material as well. I may want to dig deeper. This is my great grandfather. My grandmother, Lucy Knox Lincoln, was born in the family house at Lacey Spring which still stands by Route 11. Just last year for the first time we found his grave in the cemetery on the other side of Route 11. My father’s name was Miller Hughes Bradford, both Miller and Hughes being family names.